Werner Holzwarth, Hans. Koons. Slovakia: Taschen, 2015, p. 28. Blissett, Luther. “Sept moments-clefs dans une vie d’artiste.” Beaux Arts Magazine December 2014, p. 8-9 (installation view, International with Monument Gallery, New York, 1985). Champion, Julie and Nicolas Liucci-Goutnikov. Jeff Koons: La Retrospective: The Portfolio of the Exhibition. France: Centre Pompidou, 2014, p. 47. Champion, Julie and Caroline Edde. Jeff Koons: La Retrospective: The Album of the Exhibition. Belgium: Centre Pompidou, 2014, p. 14. Koons, Jeff and Norman Rosenthal. Jeff Koons: Conversations with Norman Rosenthal. China: Thames & Hudson, 2014, p. 26, 98 [English Edition]. Koons, Jeff and Norman Rosenthal. Jeff Koons: Entretiens avec Norman Rosenthal. Hove, England: Thames & Hudson, 2014, p. 26, 98 [French Edition]. Rothkopf, Scott, ed. Jeff Koons: A Retrospective. New York: The Whitney Museum of American Art, 2014 (edition 3), p. 71-72, illustrated in color. Galerie Jerome de Noirmont. 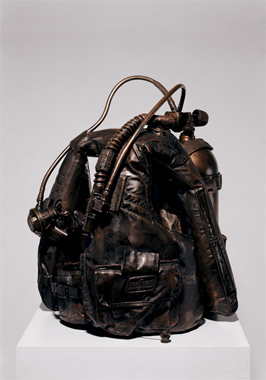 Jeff Koons: Popeye Sculpture. Exh. cat., Paris, 2010, p. 9, illustrated (installation view, Stedelijk Museum, Amsterdam) and p. 13, illustrated in color (installation view, International with Monument Gallery, New York, 1985). Obrist, Hans Ulrich. Jeff Koons: The Conversation Series. Germany: Verlag der Buchhandlung Walther Konig, 2009 (first draft), p. 78, illustrated in b&w. Serpentine Gallery. Jeff Koons: Popeye Series. Exh. cat., London, 2009, p. 73, illustrated in color. Bourdeaux-Martin, Helianthe. “Profile – Dominique Levy.” Whitewall Winter 2008, p. 42 (installation view, C&M Arts, New York, 2004), illustrated in color. Nakamura, Marie-Pierre. "USA: Jeff Koons." Art Actuel (no. 57) July/August 2008, p. 70, illustrated in color. Holzwarth, Hans Werner, ed. Jeff Koons. Cologne, 2007, p. 167, illustrated in color. Canarutto, Sarah Cosulich. Jeff Koons (Supercontemporanea Series). Milan, 2006, p. 32-33, illustrated in color. Gingeras, Alison M. and Jack Bankowsky, eds. Where are We Going? : Selections from the François Pinault Collection. Venice, Italy: Palazzo Grassi, 2006, p. 243. Melikian, Souren. Art + Auction. July 2006, p. 114-121, illustrated. Thomas, Kelly Devine. “The Selling of Jeff Koons.” Art News (104, no. 5) May 2005, p. 116 (installation view, International with Monument Gallery, New York, 1985), illustrated in color. C&M Arts. Jeff Koons: Highlights of 25 Years. New York: C&M Arts, Inc., 2004, p. 64-65. Woltmann, Marit, ed. Jeff Koons Retrospective. Oslo: Astrup Fearnley Museum of Modern Art, 2004, p. 27. Cicelyn, Eduardo, and Mario Codognato. Jeff Koons. Naples: Museo Archeologico Nazionale, 2003, p. 35, 41. Kunsthalle Bielefeld. Jeff Koons: Pictures 1980-2002. Exh. cat., 2002, p. 19, illustrated in color. Deutsche Guggenheim. Jeff Koons: Easyfun-Ethereal. Exh. cat., Berlin, 2000, p. 31 (fig. 13), illustrated in color. Bowie, David. "Super-Banalism and the Innocent Salesman." Modern Painters Spring 1998, p. 28, illustrated in color. Simpson, Fronia W., ed. Jeff Koons. San Francisco: San Francisco Museum of Modern Art, 1992, p. 53. Sorensen, Jens Erik. Jeff Koons. Denmark: Aarhus Kunstmuseum, 1993, p. 33. Stedelijk Museum Amsterdam. Jeff Koons. Gent: Snoek-Ducaju & Zoon, 1993, p. 21. Jorg-Uwe, Albig. "Jeff Koons, ein Prophet der inneren Leere." Art December 1992, p. 54, illustrated. Koons, Jeff. The Jeff Koons Handbook. Anthony d’Offay Gallery, London, 1992, p. 59, illustrated and p. 153, listed. Muthesius, Angelika, ed. Jeff Koons. Cologne, 1992, p. 19 (installation view, International with Monument Gallery, New York), 57, 65 (installation view, International with Monument Gallery, New York, 1985) and p. 66-67, illustrated in color. Ammann, Jean-Christophe. "Der Fall Jeff Koons / Jeff Koons: Case Study." Parkett (no. 19) March 1989, p. 57, illustrated. Carlsen, Peter. "Jeff Koons: On the occasion of his first museum retrospective, a look at one of the most captivating artists of the 1980s." Contemporanea International Art Magazine (vol. 1, no. 3) September/October 1988, p. 38, illustrated. Danoff, Michael I. Jeff Koons. Chicago: Museum of Contemporary Art, 1988, p. 22.